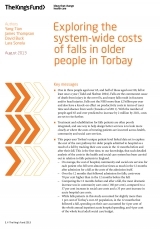 This excellent and unprecedented publication details the numbers of incidents and their associated costs in the area of Torbay in the UK. Utilising a system where patient data is directly associated with the costs of their treatment and provides a helpful insight into not just the costs associated with the incident but also the ongoing care costs after a fall and furthermore how these costs are distributed across hospital, community and social care system for falls patients. In addition co-morbitities were recorded that revealed that these were previously under-coded. Here at profane.co we don't often make recommendations, but this is highly recommended reading, I think we would even go as far to say this is essential for anyone working in falls prevention. You can read the introduction and summary or download the .pdf directly.